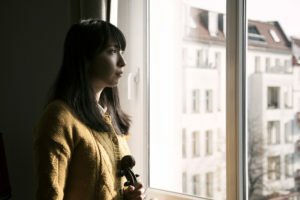 Hoshiko Yamane（山根星子）is Japanese Berlin-based classically trained violinist and composer. She is current member of Tangerine Dream. Her first solo album”A Story Of A Man” released from 1631 Recordings(Sweden) on Nov,2017. Music for the Dance performance “MUT” re-released in 2017. “Threads” in 2018.She is working with Decca Publishing for film music. Since 2015, She is working with Motimaru Dance Company as a composer and Live musician. They created together “Twilight” in 2015, “MUT” in 2017. They performed in many country with-without Live music. In 2013 she begins her electronic music project[Tukico] as solo project. 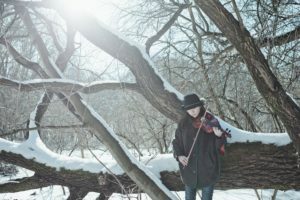 She try to play and compose minimal and ambient electronic music with acoustic violin. The outcome of these efforts is Tukico, a fusion of deep, heavy beats laced with the brilliance of her electric sound violin. She performed solo tour in 2015 with Akito Sengoku(Live OHP painting) and Atsushi Harada(Live OHP painting). She is playing in EU aria. As a violinist of Tangerine Dream since 2011, she works CD recording and Live concert in many city,UK,EU area,Canada,USA and Asia. Her debut CD is from improvisation session with Tangerine Dream in studio of Edgar Froese. This piece called “Fay Bewitching the Moon” of CD’The Island of the Fay'(2011). After the Band founder Edgar Froese passed away in 2015, the group’s remaining members (Thorsten Quaeschning, Ulrich Schnauss, and Hoshiko Yamane) continue working together in an effort to fulfill Edgar’s vision for the group. She worked in 2011-2013 with Jane Birkin on EU tour(Music directer by Nobuyuki Nakajima). Their concerts would performed more than 30 countries. She is supporting also with sub-tle. (Japan-Germany),Picture Palace Music(Germany),Cecilie Sadolin(Denmark),Esïom(France),Stadtfishflex(Germany) and Masayoshi Fujita(Japan-Germany). She collaborated with Library Tapes(music,Sweden), Tobias Svensson(music,Sweden), duenn(music,Japan), Makoto Sakamoto(music,Japan-Germany), Hironori Sugata(Dance,Japan-Germany), ALIMO(animation,Japan) and Masako Okahara(video,Japan). Her collaborated CD”nakaniwa” with duenn released from PROGRESSIVE FOrM(Japan) on July,2017. As a her project,In 2009 she made new group of Music and Contemporarydance [Tansik]. It is an experimental of Spacy and Visual music in Berlin. In TANSIK, she composes the music for its production, and pursuing the characteristic music with physical expression. They performed “Revolve”(2009), “discord”(2011), “~ing”(2012), “discord 2017″(2017). Since 2010,her own experimentall music Duo [KiSeki] with Klangstein(Soundstone) player Jürgen Heidemann. They use [Ki]wood violin and [Seki]stone klangstein to compose nature sound. They are playing a lot of place in Germany, such as a church, museum and Yoga studio. Their music is acoustic meditation,but feeling deep vibration to inside. She started classical training at 4 years old. After she graduated from Aich Prafecture University of Art and Music with the Master of Fine Art for the violin, moving to Berlin. She graduated also for Diploma in the violin in University of Music and Theater in Rostock in Germany. During study worked at Brandenburgisches Staatsorchester.